EXPRESS: What are the key messages that they need to consistently communicate? MODEL: What behaviors should they make sure to perform themselves? What attitudes do they need to portray? REINFORCE: What behaviors and attitudes do they need to reward or hold others accountable? Download a worksheet template, which includes an example. 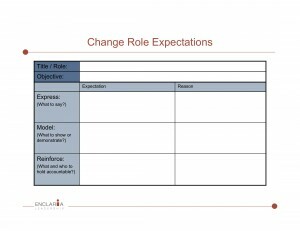 Feel free to copy the template for your own use; the only stipulation is that you provide feedback on how it worked, and what you added or removed to suit your own change initiative.